Class Email List in Excel format based on MyU Report for the course. See below for help locating the correct report. Class Accounts will automatically be granted 70,000 SUs and 3 TB of storage to share as a group. If additional storage or SUs are needed, you may submit a supplemental allocation request through our standard online process after the group has been established. Note: Class accounts will be closed two weeks after the semester ends unless an extended time is requested. Any data saved in the storage associated with class accounts is subject to removal at the end of the semester and will not be recoverable by MSI. Please Note: Class accounts are available only to faculty at the University of Minnesota. In order to create class accounts at MSI we will need the students' Internet ID information in a spreadsheet available from MyU. 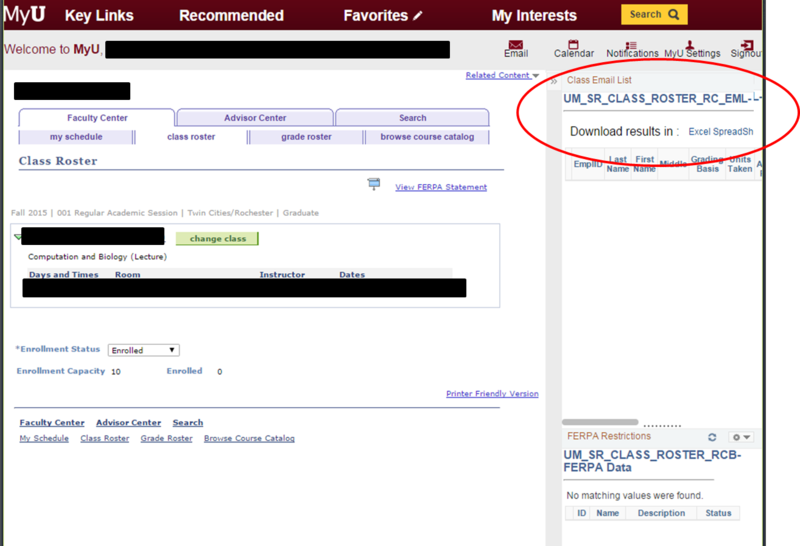 Under "Key Links", click on "Faculty Center"
Click on the Class Roster icon for the desired course. Click on "Related Content", and Select "Emails". From here you can download the required spreadsheet. Include this spreadsheet with the above information when you request class accounts. Once your class account has been created you will be able to manage it like any other MSI account via MyMSI. Once logged into MyMSI using the log in at the top of this website click your username to access the MyMSI interface. You can add new users to the class account my selecting "Manage Accounts in my Groups". This will take you to the Membership Manager interface which will allow you to add members to your class accounts via their Internet ID. Make sure and check which group you are adding members to and use the Change Group option on the right side to change to the group associated with your class.